SPECIAL EDITION LEGO COMPATIBLE IKEA CHILDREN'S TABLE AND CHAIRS WITH STORAGE - by SCS Custom Woodworks - This activity table is designed for maximum fun! It has a reversible tabletop, with a beautiful green Lego-compatible side, as well as a smooth white tabletop. Simply remove 2 screws with the provided hex key, slide the tabletop out, and flip it over. It is sure to stimulate young, curious minds through creative play! This Lego table is best for toddlers thru age 7. The table and chairs are both durable and beautiful, with solid wood legs and frame. The dimensions are 25" long x 19" wide x 18" high. The chair height is 11". It is compatible with most major brands, such as Lego, Duplo, standard Mega-Bloks, Sluban, Brik Tek, and more. It also encourages organizational skills with its two built-in storage bins. 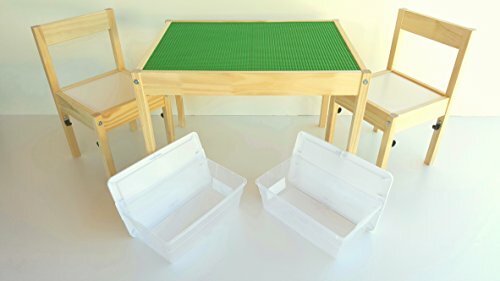 These two removable bins are perfect for keeping everything in its place! Assembly is easy, and only requires a Phillips screwdriver and 15 minutes or less. Ikea, Lego, Duplo, Mega-Bloks, Brik-Tek and Sluban are registered trademarks. They do not manufacture or endorse this product. This table is NOT compatible with the LARGE pre-school blocks, also known as First Bloks. Sorry, we cannot ship to PO boxes.